The Holiday House "The Red Lily" is located in the historic heart of Naples just a few steps from Via Chiaia and Via Dei Mille. 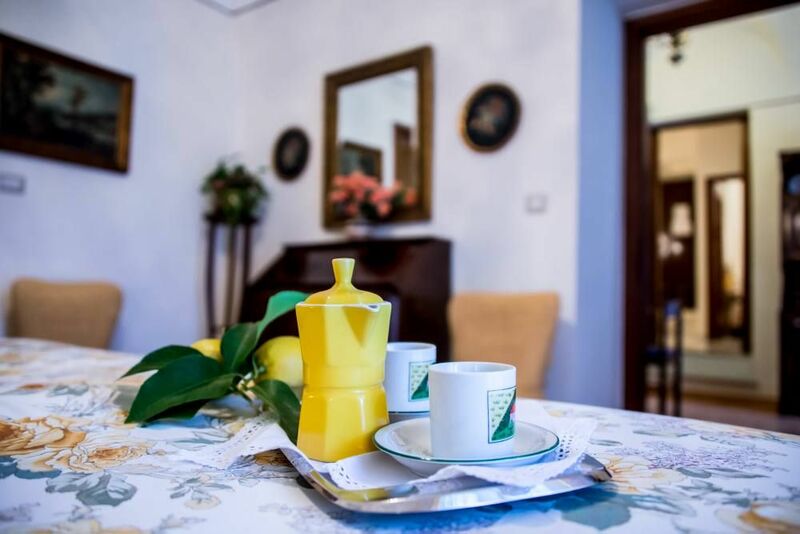 The apartment, completely renovated, with its terrace full of red lilies desire to live to its guests the true reality that goes beyond the Neapolitan wrong image often attributed to our city. It is located in a building of the '800, a few meters from the historic Piazza del Plebiscito, it is very quiet and it has all the comforts. It will make your stay enjoyable making you take a dip in the Neapolitan tradition. "The Red Lily" is a short walk from the famous Via Chiaia, Naples is famous for shopping and Via dei Mille is also known for its nightlife. Not far away is the Maschio Angevin and the harbor, from which daily ferries leave for Capri, Ischia, Procida and Sorrento. It is also near Via Toledo and then the funicular railway that connects the old town with the Vomero hill where you can visit the Castel Sant 'Elmo and San Martino Museum. If you are also fans of concerts and operas you are a few steps from the famous Teatro San Carlo, where you can appreciate good music. Hi, I am Maria Rosaria and I lived in the palace where my holiday home is located. The area is quiet and very central and is ideal for those who want to live in Naples and the surrounding area. I am really happy to have undertaken this activity because I meet so many beautiful people and in this way I have the opportunity to let my beautiful city know. The apartment while still in the center of the city is very silent and quiet. Its strong point is the terrace full of red lilies that is behind the Piazza del Plebiscito where the dome of S. Francesco di Paola church with its majesty dominates. I was very happy to host you and I hope to welcome you again in the future. Thank you so much for having chosen my apartment for your Neapolitan holiday. Follow the signs to Piazza del Plebiscito - Piazza Trieste e Trento, just after the San Carlo Theatre and the Galleria Umberto I go around the fountain and head towards Piazza del Plebiscito. Immediately after the famous Bar Gambrinus lined Piazza del Plebiscito and soon after you arrive in Piazza Carolina. Continue straight and you will be in Via Gennaro Serra. Outside the station of Piazza Garibaldi, cross the square and take the R2 bus to the last stop in front of the Galleria Umberto I. Once off the direction of Piazza del Plebiscito and passed the Bar Gambrinus lined the square and once in Piazza Carolina take the hill. Capodichino airport outside the terminal, take the ALIBUS to the terminus in front of the Galleria Umberto I, and follow the directions above. with their charm will be a wonderful stage of your vacation in Naples. Not far away lies the elegant Coffee Bar Gambrinus and the Professor's where you can enjoy an authentic Neapolitan cafe. is located in front of one of the most famous theaters in Italy: S. Carlo and adjacent to Via Toledo. While strolling among the shops you can enjoy between one purchase and another delicious "puff" of "Pintauro" and the delicate baba of "Mary." where you can admire the remains of Pompeii and Herculaneum. with the churches and the most important monuments of the city (St. Clare and its cloister, the church of Jesus, San Domenico Maggiore, the Cappella di San Severo with its veiled Christ, San Gregorio Armeno with his nativity, church San Lorenzo with the underlying "macellum" Roman and the adjacent museum, the Cathedral). The area is ideal to enjoy the authentic pizza margherita (from "Sorbillo", or "Antica Pizzeria Angel"). is the hilly area of Naples. Can be reached by funucolari are three: Central, Chiaia and Montesanto. Here, you can visit the Museum of San Martino and Castel S. Elmo and the Museum of the Duke of Martina Franca, famous for its pottery, which is located inside the park Floridiana. I prezzi sono da intendersi per l'intero appartamento con un massimo di 5 persone. Cauzione: 100 € Pulizia finale: 30 € Tassa di soggiorno: 2 € a persona per notte ( escluso i minori di 18 anni) Sarà richiesto un pagamento extra di Euro 20,00 per il chek in dopo le ore 20 Consegna delle chiavi da parte del Proprietario non presente in loco.